Like many spring-flowering native plants, wild geranium flowers have the ability to self-pollinate when no pollinators are present. However, the flower matures to ensure cross-pollination when insects are present, with the row of outer anthers developing on the first or second day after the flowers open, followed by the inner row on the second or third day. The stigma becomes receptive after the anthers have dehisced on the third or forth day. 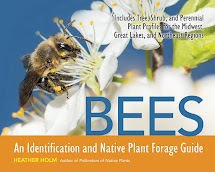 Bees, flies and beetles visit the flower for nectar and pollen. Nectar is secreted from five glands located between the stamens and sepals. In a study by Bertin et al, bees visiting for nectar were responsible for depositing more pollen than pollen collecting bees. 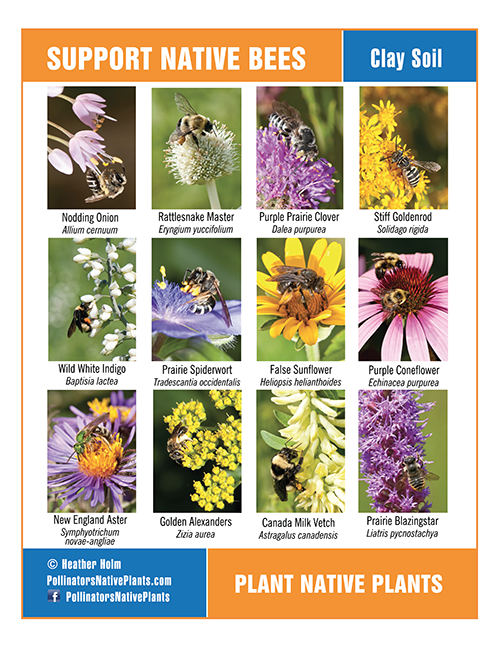 Larger bees such as bumble bees and mason bees are considered effective pollinators because pollen brushed onto the underside of their abdomen contacts the stigma. 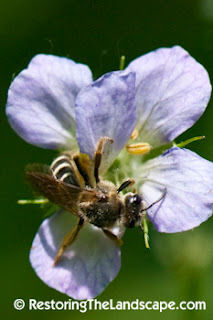 Smaller bees are able to circle around the base of the stamens feeding on nectar without coming into contact with pollen from the anthers above. 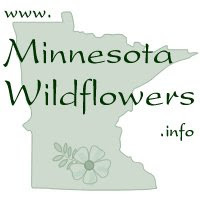 Wild geranium flowers are over one inch in width and extremely showy. Dark lines on the flowers act as nectar guides, showing pollinators the location of the nectaries at the base of the stamens. 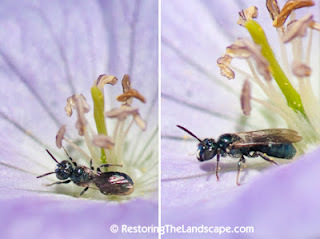 Small Carpenter Bees, Ceratina spp. Smaller bee species circle the base of the flower seeking out nectar without coming in contact with the anthers and stigmas above. Wild geranium is a nectar source for this cuckoo bee in early spring. Female Nomada bees lay their eggs in the nests of ground nesting native bees, especially mining bees (Andrena spp.). 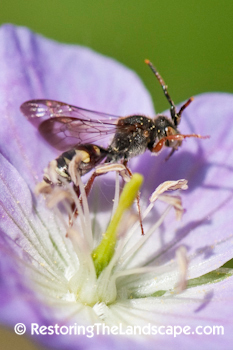 The cuckoo bee eggs hatch and the larvae kills the host bee larvae and consumes the provisions provided by the host. Nomada bees are reddish-brown to black with yellow or white markings. 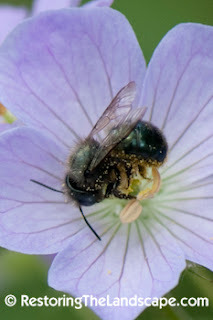 Mason bees visit wild geranium for both pollen and nectar. Females land on top of the anthers gathering them together with her legs. Pollen is brushed onto the pollen-collecting hairs on the underside of the abdomen. Wild geranium is an important source of pollen and nectar for mason bees, it flowers when females are provisioning their nests. Sweat bees visit the flowers to feed on nectar. Long, dense hairs cover the elytra of these beetles where pollen grains attach. 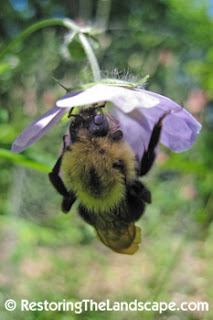 Adults emerge from the soil in early spring, feed on host plants (raspberries, blackberries and avens), mate, then lay eggs. Larvae burrow into the flower buds and fruit of the host species and buds drop off or decay. Fruit becomes misshapen and ‘wormy’. 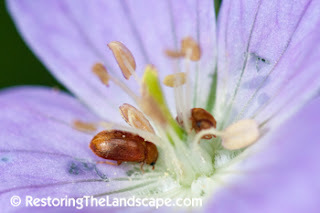 Look for adult beetles feeding on the pollen of woodland natives in early spring such as Viriginia waterleaf and wild geranium.